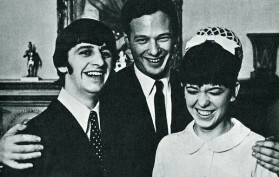 Thursday 11th February 1965 Ringo Starr marries Miss Maureen Cox, a hairdresser from Liverpool at Caxton Hall, London at 8.15am this day. The ceremony lasted all of 10 minutes and was booked just two days earlier. Ringo had proposed to Maureen at the Ad-Lib club in London on the 20th January of the same year….